This compilation contrasts salon-type pieces for violin and piano with more for cello and piano. They were recorded in 1956 and 1969 respectively. The booklet does not give details of recording locations. The majority of the pieces are quite recognisable, if not well-known by name. Most concentrate on displaying the virtuosity of the violin or cello with the piano parts subordinated. Many have showy presto sections contrasted with inner slower, more introspective, often tenderly sentimental material. The most consistently satisfying performances come from Ferrari and Cognazzo. They open the programme with a nicely affecting reading of Fauré�s sad little Après Un Rêve and close it with an equally heart-felt reading of Saint-Saëns Le Cygne. In between there are: the bouncy gypsy-like rhythms and sweet sentimentality of Hillemacher�s Gavotte tendre, the stately sadness of Boccherini�s Adagio, the liturgical solemnity of Lalo�s Lento (Chants russes) and the tragic gravity of the Tartini, all contrasted with the hectic Scherzo of Van Goens. 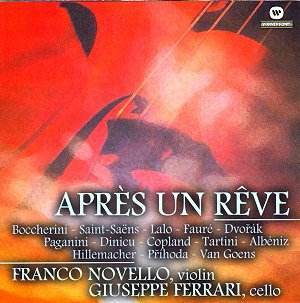 Violinist, Franco Novello�s brilliance, clarity and presto virtuosity inform Př�hoda�s Capriccio and the same composer�s joyful Ländler, bouncy then quietly lyrical almost a lullaby before showy virtuosity. Novello�s own Malinconia sighs sweetly. Copland�s two pieces are nicely evocative: the Notturno gently murmuring while the Ukulele serenade is cheeky and jazzy (a shade too shreiky perhaps). Dinicu�s well-known fiery gypsy piece, Hora staccato � is just that! But it has to be said that Novello and Gachet�s performances are uneven; we were disappointed with some of the transcriptions they played, disappointed with their joyless flatly-stated reading of Albeniz�s Tango, the rather matter-of-fact approach to the Paganini Adagio and their dirge-like Melodia that drained Dvoř�k�s appealing New World music. For the most part recognisable salon music pieces. Performances vary; like the curate�s egg, good in parts.